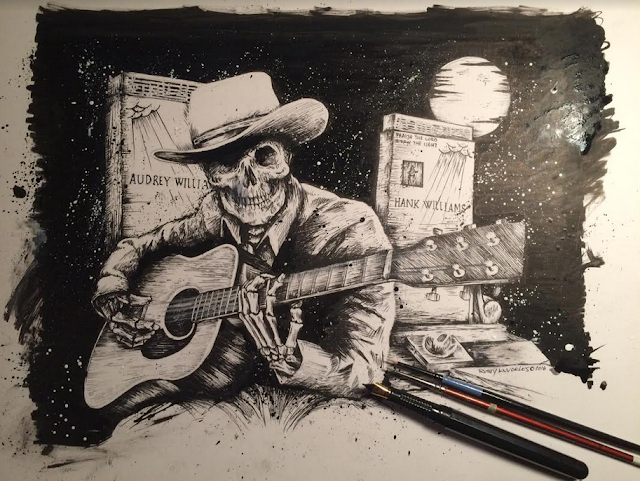 Would like to say thank you to everyone who has really dug this illustration for Billy Don Burns new album cover, Graveyard In Montgomery and all the shares. We thought on it and realized that maybe we should give away the original art for the album as a way to say thank you to the fans for sticking by him through thick and thin. So this Friday, once we announce the pre-sale, every physical album order sold through our webstore will be entered into a drawing to win the original pen and ink sketch. Sure you can wait to stream it for free on Youtube or Spotify, but if you want something to live on past your next Appleoid Omega malfunction, purchase the album and maybe this art along with BD's story about his travels to that infamous graveyard and much more can potentially hang on your wall and reverberate from your speakers for years to come.